The 5 mile walk was a stroll up to Gaping Gill to the caving meet where, for a tenner each, you get dropped by bosun's chair into the cavern (the £10 includes the ascent too). Good waterproofs are recommended because it is cold wet experience and much as we prefer the outsides of hills to their insides, this is really worth doing - worth every penny. Two meets a year, one at the end of May and the other at the end of August, open the cavern to mere mortals. Despite all the boundless enthusiasm of the cavers we managed to avoid the bug and won't be adding it to our outdoor activities. Support Teams are sorted after being ravaged by illness and injuries and now just kit to be packed and butties to be made. Forecast looks fairly benign with just a little rain on Saturday afternoon. The cloud cover seems pretty complete and, at least, overnight will probably be lower than the tops. Wind could be strong enough to be a nuisance but probably not much more, I hope. I feel more relaxed about this attempt than I did for all my previous attempts although tomorrow will change, I am sure. Leg 2: Dave Bateson, Keith "Splinter"
Thanks to you all and I am looking forward to seeing at different stages throughout Saturday. There are, at least, 3 other (clockwise) "Bob Graham"s scheduled for this weekend and I wish you all the very best of luck. Last weekend it seemed like Autumn had arrived early. 14 miles over Winter Hill with many of them in pouring rain and on Sunday in the Lakes the weather was even worse. Heavier rain and stronger winds. Descending Fairfield to Grizedale Tarn was unpleasant as the wind kept trying to blow me down into the tarn but a bit later, on the way back, there were two occasions re-ascending Fairfield when the wind was simply too strong to make any progress into. I had intended, having started just above White Moss CP, to go to Helvellyn (or perhaps the Lower Man) but when I reached Dollywagon Pike (from Seat Sandal) the wind was troublesome and again threatening to blow off my feet. Progress to Helvellyn wouldn't have been too bad but I was concerned about getting back when I would have to run into the wind which strengthening as the day went on. Back over Seat Sandal would provide enough climbing and so I turned on Dollywagon for the big descent to Greizdale Tarn. There were very few people out on the hills and it was eerie to cross Fairfield's summit twice and see no one, even allowing for the poor visibility in the clag. Two sessions a day for the rest of the week and I accumulated almost eighty miles for my last full week. Sedbergh Hills on Sunday for a last run out before a two week taper and I think it is the taper I like least. After getting used to this sort of mileage and two sessions a day it is unsettling not to be doing them both. I hope I will be able to finalise support arrangements next week - Leg Two is still a bit thin so if you might be able to help, please let me know or post a comment below. 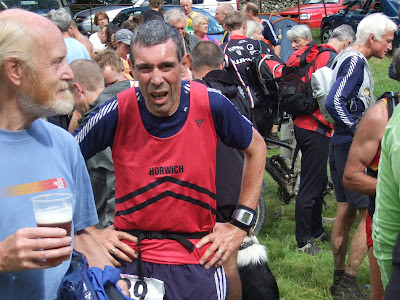 Last year Borrowdale was shortened on advice from MRT on the summit of Scafell Pike and in 2006 I was resting in preparation for my second BG and so it was 2005 when I previously ran the full route. I had a poor run and so have waited three years to put in a better performance on this rough, tough route. These must be amongst the hardest 17 miles in the Lakes and in 2005 I was a pair of Inov8 Mudclaw 270s for their first serious outing. I mention this only because some of the ground is so rough that the uppers of the shoes were shredded - in places they had been ripped open - so not 270s this year. Last year I found 330s survived rather better although without the scree descent to cope with it isn't a fair comparison but 330s it would be again. Ground to Esk Hause was wet and very soft but the rain had all but cleared through by the time the race started. The clag was down on Scafell Pike, Great Gable and Green Gable and the rocks were wet and slippery almost everywhere and especially around Scafell Pike. Most of the walkers descending to Esk Hause seemed pretty uncomfortable on the wet boulders which wasn’t encouraging but by staying clear of other runners I didn’t struggle as much as others around me. Approaching the summit was a little eerie, there were no other runners ascending but those descending were heading in all directions appearing and then disappearing into the clag - most made their way to the scree and thence to Sty Head where the usual crowds awaited. Swapping an empty bottle for a full one which Pauline had carried up I set about the serious business of eating and drinking my way to the summit. This must have gone well because I picked up a number of places on the way up and reached the summit chasing after Horwich vest (worn by Mick Crook). Most of the navigation errors seem to have taken place on the Great Gable descent with others going wrong between Green Gable and Honister. Leaving Great Gable and knowing we weren’t on the fastest descent route I decided not to go and look for it on my own (better to loose a few minutes rather than getting seriously lost, which was very possible) and stayed on the ‘tourist route’, passing Mick on the way down. A lapse in concentration and I went over Green Gable instead of round but again I avoided getting lost although it cost me a little time. Down out of the clag and route finding was much easier into Honister. Dale Head was never going to be easy and I struggled to stay with the group I had joined at Honister and then on the way down saw another RMI vest. Passing Steve Jackson and then Richard Baker (who was having a major bonk although it wasn’t obvious at the time - Richard has recovered enough to help on my 55@55, thanks Richard) I reached the flat run to the finish – only to lose 3 places. One to another V55, the second to Mick Crook and the third to Steve Jackson! All I can say is “well done, guys” because I had almost nothing left in my legs at the finish I had taken 30 minutes off my previous best (2005) time and ended up with 12 English Champs points which is 11 more than I have ever had before. In an attempt speed up recovery we tried mountain bikes rather than running and I don't if it helped but it was much more fun. The rest of the week was little more than a series of recovery runs until last night's Hill session that more or less proved I need a rest day today. Winter Hill on Saturday morning and Lakes on Sunday for what will be my last full week before my second attempt. Coming together now but I could still so with a bit on help on Leg Two (from Honister to Wasdale). I know it is an early but there is the promise of a sunrise that won't be seen on any other leg! If you might be interested in helping please contact me or leave a comment below. Coope's Dozen is the traditional, last, long (18 miles) 'pre-Borrowdale' training session - a round of the 12 tops of the Winter Hill massif - run in a group (or groups) until Healey Nab the 12th when it becomes a race back to the Upper Barn at Rivington. A small "Fast Group" (these things are relative) of Albert Sunter and myself and a larger "Slow Group" of Pauline and others. More details and some photos are on Ed's blog http://www.wfdbwgua.blogspot.com/. Albert dragged my round almost half an hour quicker than I had managed previously, showed me some better routes and graciously waited as I shuffled the last leg back to Rivington. Always a good day out with its 'trying moments' and this year the vegetation is particularly profuse - the climb to Counting Hill is never good but the bracken is the worst it has been for many years. We tried to find a near-direct line to Old Adam and again the vegatation made us suffer, this was a bad mistake and, as a consequence, I am sure I could improve on the 03:32 we recorded on Saturday. I allowed Sunday as a recovery day but my legs were so tired on Monday and, especially, at the track on Tuesday I decided to rest for the remainder of the week before Borrowdale on Saturday. Last year it was shortened and on the only other occasion (2005) I have run it I had a pretty dreadful run taking over 5 hours and only just managing 18 minute miles which is my slowest ever race pace. I ought to be able to improve on that although if it as hot as it has been for the rest of this week it could be a 'close run thing'. Beyond Borrowdale I'll do what I can on Sunday and thereafter in what should be my penultimate training week before a couple of easy weeks. After this weekend I need to finalise the logistics and support arrangements. The end of August that seemed a good weekend clashes with an English/British counter as well as the Ultra Tour de Mont Blanc so a number of runners who have helped previously are committed to other things.